For the first time in school history, both programs are earning recognition in the national polls in the same season. It appears winning streaks are contagious at UCF. 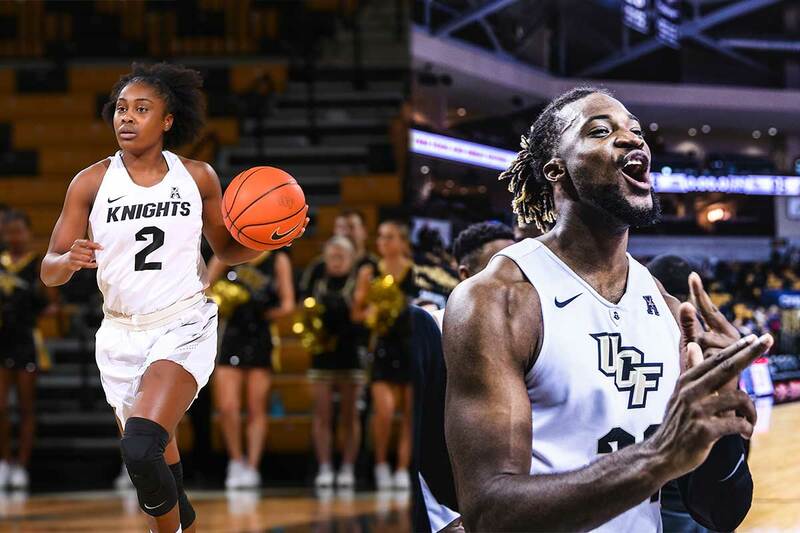 The UCF men’s and women’s basketball teams both notched victories against American Athletic Conference opponents in Sunday’s doubleheader at CFE Arena to remain undefeated in league play. The women took their game down to the wire against Cincinnati and came out on top, 56-55, thanks to junior guard Kay Kay Wright’s layup with five seconds remaining in the game. Fueled by four Knights who scored in double digits, the men followed up with a 76-65 win over East Carolina. The two squads are receiving votes in both the Associated Press top 25 and USA Today Coaches top 25 rankings. It marks the first time in school history that both programs are earning recognition in the polls in the same season. The women’s team has won four in a row and is off to a 3-0 start in conference play for the second straight year. With a 14-2 overall record, the Knights are in the middle of one of their best seasons in program history. UCF has defeated eight opponents that made either the NCAA Tournament or WNIT last season. Part of the reason for the Knights’ success can be attributed to their stellar defense. UCF leads The American and ranks among the top 10 in the nation for scoring defense, limiting opponents to an average of 53.6 points per game. Wright, who scores 19.3 points per game, is also a major factor as the second leading scorer in the conference. Ticket information for the women’s games can be found online at ucfknights.com. With a 13-2 overall record, including 3-0 in conference games, the men’s team currently sits atop The American’s standings as the only remaining unbeaten team in league play. The Knights are currently riding a seven-game winning streak — their longest streak since the 2010-11 season. UCF boasts two of the conference’s top scorers in senior guards B.J. Taylor ’18 (17.3 points per game) and Aubrey Dawkins ’18 (15.9 points per game) and two of the league’s best shot blockers in senior forwards Tacko Fall (3.1 blocks per game) and Chad Brown (1.2 blocks per game). In fact, Fall has already claimed the school record for career blocks and currently ranks seventh in the country for total blocks so far this season (47). Ticket information for the men’s games can be found online at ucfknights.com. Fans can catch both teams at CFE Arena at their next doubleheader Saturday, Jan. 19. The men tip off first at noon against Tulsa, and the women will follow at 2 p.m. against SMU. The teams are in action separately before the weekend. The men will play on the road at Wichita State at 10 p.m. ET Wednesday, while the women are home on Wednesday at 6 p.m. against Tulsa. Fans can also enjoy a unique opportunity to interact with UCF head coaches Johnny Dawkins and Katie Abrahamson-Henderson at today’s UCF Knight Talk. Hosted by longtime play-by-play announcer Marc Daniels, UCF Knight Talk is a weekly radio show held at Burger U at 6 p.m. on Mondays leading up to the American Athletic Conference Tournament. The show is free for all fans to attend and there will be opportunities to ask questions during the live program.